"The Man From Nowhere" triumphed at the 2010 Korea Film Awards on Thursday, raking up the most trophies at the annual ceremony including its main star Won Bin who won the prize for best actor. 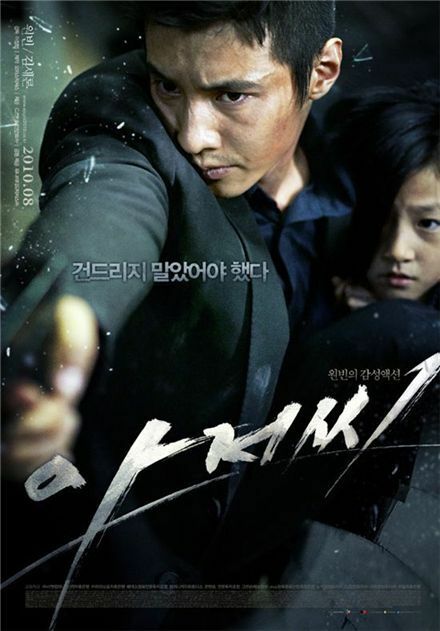 The action flick directed by Lee Jeong-beom took the awards for best actor, best new actress, best cinematography, best music, best lighting, best visual effects and best editor. The movie, also starring child actress Kim Sae-ron, has been one of the hottest movies of the year, attracting over six million moviegoers during its run on the box office for several months starting August. Won Bin, 33, had been up against Park Joong-hoon for "My Dear Desperado", Park Hee-soon for "Barefoot Dream", Choi Min-sik for "I Saw the Devil" and Jung Jae-young for "Moss". Won Bin's role as a reclusive former special agent who befriends a young girl next door has won him his second award for best actor -- the Daejong Film Awards held in late October deemed him the best actor of the year as well. Meanwhile, Seo Young-hee nabbed the award for best actress with her role in "Bedevilled", ousting nominees Yoon Jung-hee for "Poetry", Jeon Do-yeon for "The Housemaid - 2010", Moon So-ri for "Ha Ha Ha" and Jung Yu-mi for "My Dear Desperado". Critically acclaimed director Lee Chang-dong's film "Poetry" starring veteran actress Yoon Jung-hee took the prize for best picture, best director and best screenplay. The picture has won a total five awards for best screenplay, including at this year's Cannes Film Festival, the Buil Film Festival, Korea Film Critics Association Award and the Daejong Film Awards.